The European standard EN 388:2016 – ‘Protective gloves against mechanical risks’ was published to supersede EN 388:2003. General-purpose protective gloves account for the largest market share of all personal protective equipment (PPE) sold to protect wearers from a wide range of hazards. To assist wearers with the selection of appropriate gloves, several European safety standards – including EN 388:2016 – were developed, enabling levels of protection against different risks to be defined. These defined levels of protection enable appropriate gloves to be selected, based on the hazards and risks identified for a specific work activity. The EN 388:2016 standards are intended to be used in conjunction with EN 420:2003+A1:2009 – ‘Protective gloves – General requirements and test methods’, which is designed to ensure that the gloves themselves do not cause harm to the wearer and are comfortable to wear. EN 420 is currently under revision and will become EN ISO 21420 once the standard has been updated (anticipated to be in 2019). EN 388:2016 specifies requirements, test methods, marking and information to be supplied for protective gloves against the mechanical risks of abrasion, blade cut, tear, puncture and, if applicable, impact. The test procedures include a separate test for each of these properties. A performance level is determined according to each test result – the higher the number or ascending letter, the greater the level of protection. Results are displayed using a pictogram (Figure 1), permitting clear understanding of the capability of the glove. When compared with EN 388:2003, there was a major technical change to the abrasion resistance method, relating to the choice of abrasive paper. The abrasion resistance test is undertaken on a Martindale abrasion machine, in which specimens of the material (cut from the palm of the glove) are fitted to a rubbing head of fixed size and weight. This head is then moved in an elliptical motion over a table covered with 180 grit abrasive material (a change from the 2003 version, in which 100 grit was specified). Four specimens of the material are tested, with the test result being the number of cycles required to abrade through ('hole') the material. The performance level of a single material is decided by the lowest result of the four tests. For multiple layer materials (where the test specimen is made of several unbonded layers), each layer is tested separately and the performance level is based on the sum of the number of cycles. Four levels of performance are defined within EN 388, ranging from 'level 1', (which is equivalent to holing between 100 and 499 cycles) to 'level 4', where holing does not occur before 8,000 cycles, as shown by Table 1. The 2003 version of the standard contained the test procedure for a circular blade cut test, also known as the 'coupe test', with reference also made to a straight blade cut test for materials with a higher cut resistance. The circular blade cut test is carried out on the SATRA STM 611 circular blade cut resistance tester, which consists of a counter rotating blade (under a standard 5N contact force) which tracks backwards and forwards over the flat surface of the test material within a fixed stroke length (Figure 2). Where multiple layer materials are present, the layers are assembled and tested as they would be in the glove. The test stops when cut-through of the blade is detected (via electrical contact with the underlying surface), and the number of strokes completed by the blade is recorded. To take the sharpness of the blade into account, the test is performed using a standard canvas control material both before and after testing the specimen. A 'blade cut index value' is calculated from the number of cycles required to cut through the specimen and the mean number of cycles required to cut through the control material. A specimen is taken from two separate gloves and five test cuts are made on each, which allows for any variation across gloves. A mean blade cut index is calculated for each specimen tested. The performance level is based on the lower mean blade cut index of the two specimens, ranging from a level 1 cut resistance index of greater than 1.2, up to level 5, with a cut resistance index greater than 20, as shown in Table 1. It is also worth noting that EN 388:2016 has introduced several improvements to the controls on the blades. 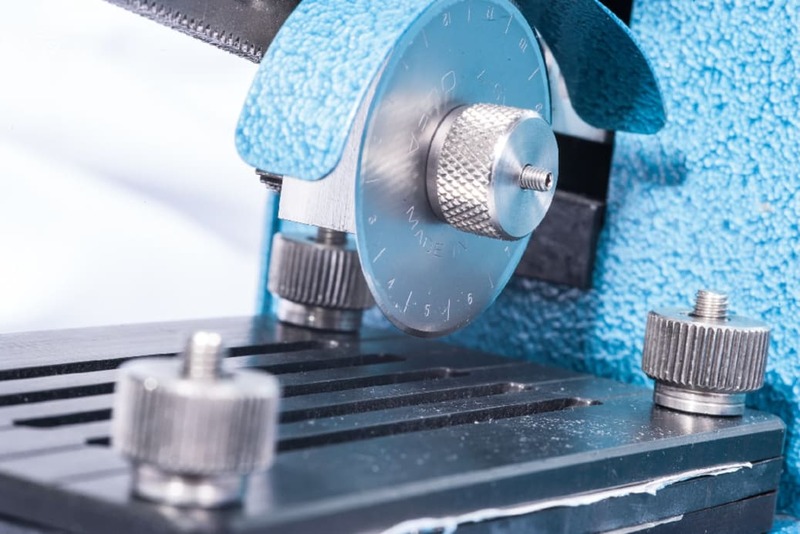 Using the circular blade cut test for composite fibre-based materials (including advanced technology aramids) and other specialised materials has its limitations. For all these products, which are designed to achieve high levels of cut resistance, the dulling of the blades during the extended testing means that results for the second control specimen can be meaningless. Glass fibre and abrasive surfaces may also give variable results between individual cuts, due to local variations in the specimen. Steel fibres risk creating an electrical contact with the specimen holder, thus indicating a false reading in the cut-through point. The alternative straight blade cut test method given in the 2003 version of the standard, ISO 13997:1999 – 'Protective clothing – Mechanical properties – Determination of resistance to cutting by sharp objects' was included within EN 388:2016. If, during any individual circular blade cut test, the number of cycles to cut through the reference material increases by a factor greater than three or cut through has not occurred after 60 cycles, the ISO 13997:1999 cut resistance method becomes the reference test method for the assessment of cut protection. This test is alternatively known as the 'TDM cut resistance test' and can be carried out using a SATRA STM 610 cut resistance evaluator. 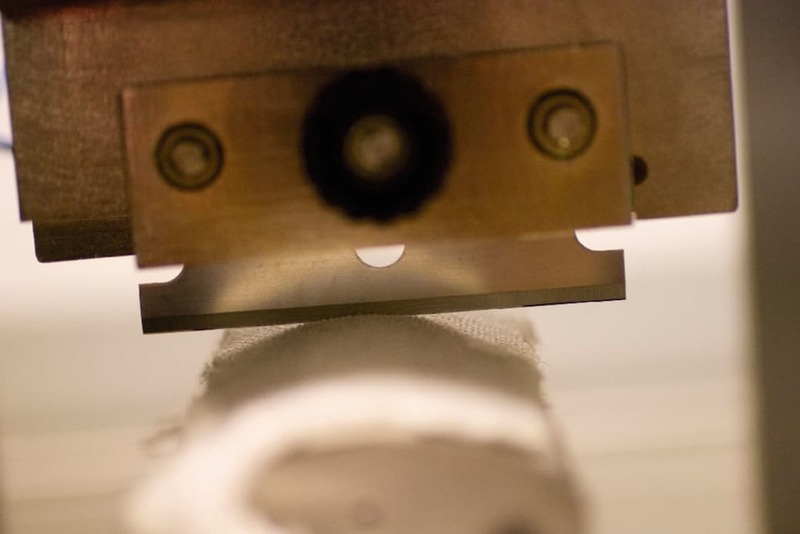 The test uses a straight blade drawn across a specimen until cut-through takes place (Figure 3) and measures the contact load applied to the blade in order to make a cut-through over a 20mm stroke length. Because the blade only travels once over the specimen and each blade is only used once, the problem of blunting blades with repeated cycles is eliminated. A number of tests are carried out with different contact loads applied to the blade. Force and cut-through length are plotted on a scatter graph and a trend line is generated. This is used to estimate the average contact force necessary to cut through the glove material with a 20mm stroke length. Once determined, the identified force is applied to the specimen a further five times. If the results of the stroke length are within the defined tolerance levels, the test is then complete and the force has been determined. The performance levels range from 'level A' cut resistance with a contact force between 2N and 5N, up to 'level F', with a contact force greater than 30N, as shown in Table 2. No major technical changes to the tear resistance method were made between the 2003 and the 2016 versions of EN 388. In this test, specimens of material from the palm of four gloves (two from the ‘longitudinal’ direction and two from the 'transverse' direction) are prepared and clamped in the jaws of a standard tensile strength testing machine. The jaws are moved apart at a constant speed (100mm/min), and the force needed to tear the material is measured. For single materials, the performance level is given by the lowest result of the four tests. For multiple, unbonded layers, each layer is tested individually. Four tests are carried out on each layer, and performance is based on the lowest individual result of the most tear-resistant material. EN 388:2016 defines the performance levels as ranging from level 1, whereby the specimen can resist a peak force between 10N and 25N, to level 4, where the tear strength is at least 75N. There were no major technical changes to the puncture resistance method between the standard’s 2003 and the 2016 versions. Test specimens are taken from the palm of the glove and, in the case of multiple, unbonded layers, the layers are assembled and tested together as they would be in the glove. The test uses a standard, rounded stylus which is pushed 50mm into the specimen at a constant speed of 100mm/min using a compression test machine. The maximum resistance force is recorded. Performance levels are based on the lowest of four test results – defined in EN 388 as being from level 1 (with a puncture resistance force of between 20N and 60N) to level 4, which has a measured resistance of at least 150N. For gloves made from composite or specialised materials and intended for specialist applications (such as protection against hypodermic needles) the standard puncture test stylus is too thick, but tests are available that use a needle, as opposed to the wider stylus. EN 388:2016 contains a test for impact resistance where testing is carried out in accordance with clause 6.9 of EN 13594:2015 – 'Protective gloves for motorcycle riders. Requirements and test methods'. This is an optional test that was not included in EN 388:2003, and is used for gloves which incorporate specific impact-resistant properties which may be added to the palm, back of the hand or the knuckles. In this test, gloves are cut, opened out flat, so that the area of impact protection can be tested independently, and secured over a domed anvil. The test area is impacted with a 2.5kg flat face striker from a sufficient height to provide impact energy of 5J. The peak force – detected by a load cell or sensor mounted beneath the anvil – is recorded. Four tests are carried out on specimens of each area of protection taken from four different gloves. Gloves must meet the requirement of level 1 of EN 13594:2015 – that is, the mean transmitted force shall be ≤7.0kN with no single results greater than ≤9.0kN. For gloves satisfying the requirements of EN 388, the mechanical properties of the glove shall be shown in a pictogram, followed by the respective performance levels of each mechanical test (see figure 1). The first number corresponds to the abrasion resistance, the second to the circular blade cut resistance, the third to the tear resistance, the fourth to puncture resistance and the fifth character (a letter) to the straight cut test. If either the circular blade cut test or the straight blade cut test has not been performed, an 'X' should be used in place of an achieved level. In addition, a marking code 'P' may also be added for gloves meeting the impact-resistant requirements of EN 388:2016. For the first four tests, it is a common convention to indicate '0' when level 1 cannot be attained. The pictogram shall not be used if the glove does not achieve at least level 1 or level A for at least one protective category. When compared with EN 388:2003, EN 388:2016 has some additional requirements for the user instructions to be supplied with the gloves. If impact protection is claimed, the user instructions shall state the part of the glove for which the protection is claimed, and highlight that the protection does not apply to the fingers. For gloves with a tear performance of level 1 or greater, a warning must be included that these gloves should not be worn where there is a risk of entanglement with moving parts of machines. Finally, for products where performance levels are given for both cut tests, include the statement: ‘The circular blade cut test results are only indicative whilst the straight cut resistance test is the reference performance result’. Manufacturers and suppliers will be keen to offer gloves that are certified using the latest version of the standard. Indeed, due to the new PPE Regulation, after 21st April 2019 it will be illegal to place gloves for mechanical protection on the EU market that have not been certified against the state-of-the-art (that is, EN 388:2016). 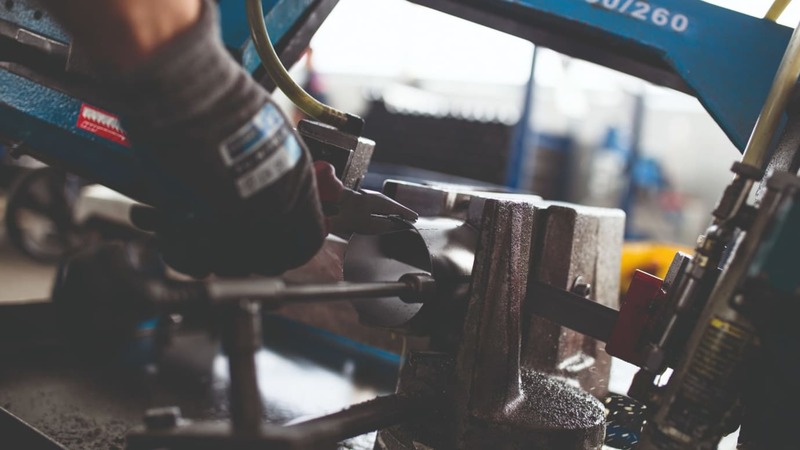 With the introduction of a second rating for cut resistance and an optional rating for impact protection, there will no doubt be some confusion for people involved in the selection of gloves and some explanation or support may be required.